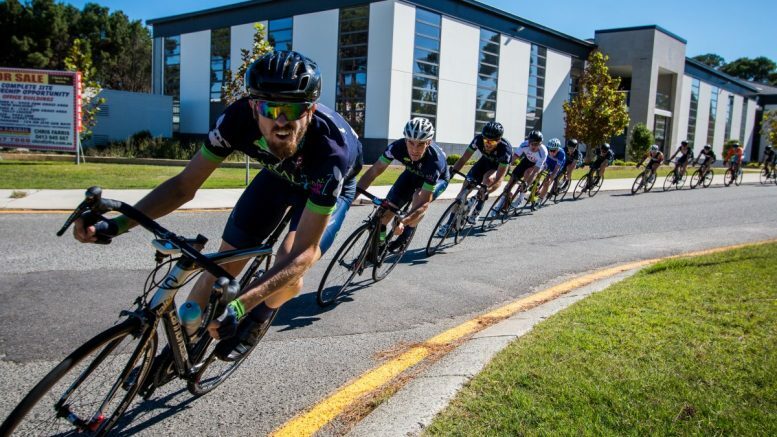 The 2017 Western Australian state criterium championship was held at Tech Park in Bentley on Sunday 19/03. 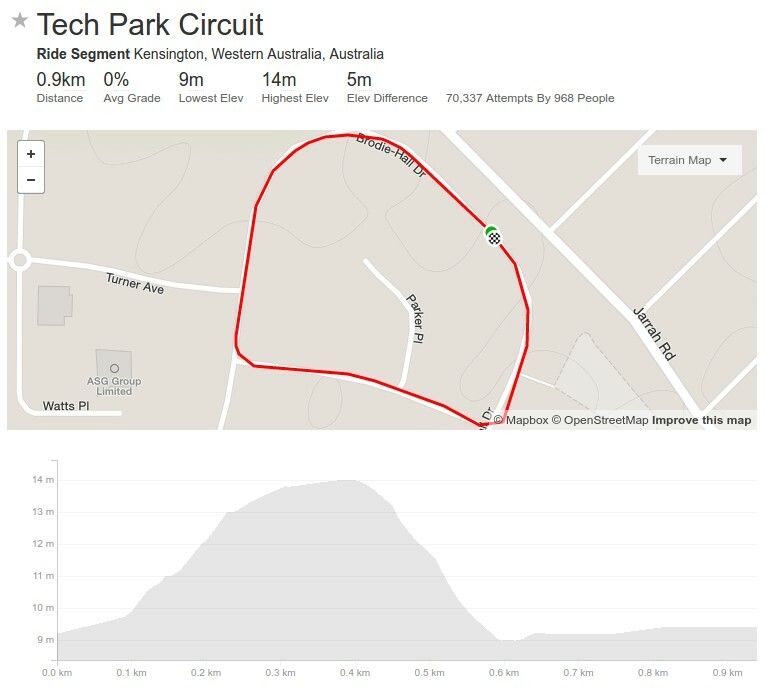 Tech park has the finishing straight up a gradient, a big graceful bend up the top, a quick downhill and left hander into a more moderate left hander back onto the finishing straight. There is some potential for wind at the bottom of the circuit.The weather was perfect, the turnout moderate and the event well run. It was great watching the other age groups contend for a state championship. Championship races always bring about a new kind of desperation in riders. I arrived around 12.40, grabbed an espresso and my number with the obligatory 8 pins. Had a quick chat with some friends and then grouped up with the team. We decided to sneak off to Shelley for a half hour to get the engines running before the race. A good hard roll through on a tailwind is also an excellent way to prime the mind for fast racing. As we lined up, the numbers game suggested it was going to be a tug of war between us (Oral 7 GDT, soon to be Santic GDT) and Veris. Henry from Satalyst threw down an attack early which was controlled between our two teams. Guy Kalma, mysteriously transitioning from Attaque Gusto through plain clothes to Veris provided some substantial drive up the finishing straight. I think he was testing his legs and ours. Henry was brought back but this wouldn’t be his only time off the front. The first 30 minutes was a constant shuffle. Riders would attack, we would either cover the break or shoot it down. If not us then Veris. Eventually a solid break got up the road and we were able to relax at the front briefly. However this was chased back by some outside influences and the dice rolling began again. For the most part, the whole race was raced with aggression. Coming into the closing minutes things would become chaotic. A threatening three man break got up the road with Lewis McCrea (Satalyst), Leighton Cook (Veris) and Guy Kalma (Veris). It would be moderated a bit by the loss of Lewis to a flat but the two Veris riders are very strong. I rolled onto the front with team mates Jake and Rich to kill the break and force a sprint. Rolling 30s turns with painfaces on display we started to haul it back. About 4 laps from the finish the struggle claimed a casualty. Unfortunately my team mate Brian was squeezed out against a kerb on the downhill. Travelling roughly 50km/h he fell across the kerb and hit a signpost. Being on the front of the bunch, I couldn’t do much. I yelled at the commentators/organisers when passing the finish line 40s later to let them know to send the first aid van around. He was later found to have broken 3 vertebrae. With 2.5 laps to go, I popped and rolled from the front to off the back. Jake did some stellar work continuing to close the gap, getting some assistance from Henry. We’re still having some teething problems in our lead out but I’m pleased that Champy managed 7th given he’s a workhorse and drove a lot of the race on the front. We didn’t get the gong but I personally learned a few lessons and got some savage racing in the legs. Here’s hoping for a speedy and true recovery for Brian. Be the first to comment on "WA State Criterium Championships Race Report"